Using 2.9.5, I have two dropdowns on the same tab and the second dropdown is rendering when you click on it under the first dropdown. In the attached picture when I click on the dropdown that is in the box, it renders underneath the dropdown pointed to by the arrow. Guess I can not attach a file — I will send it by email. First of all this is the first time I have started to use your solution and I LOVE it! Great job! 2. I am trying to hide a list of fields if a user enters any value into a currency field and I cannot get it to work. I have tried greater than 0. I also tried greater than and left the value field blank. Any ideas or assistance for this? 3. Is there an easy way to hide a list of fields when a new form is opened? I hope this makes sense and thank for the help! I have fixed a bug with the missing trigger for currency fields. Use “Greater than : 0” as trigger. I could not recreate the IE 8 issue with tooltip. If you have more info I’ll take another look. I have added an option to initially hide a list of fields. You find it under the Misc tab. Thanks much for the updates. I will take a look and see if I still have the tooltip issue after I change the js file. A quick question though. I have a list that has multiple content types where the fields differ content type to content type. However, since I’ve applied your solution, I can’t seem to set the use of tabs for each content type. It seems to set for the default content type and then when other content types are selected from the New menu, none of the content type specific fields so up, only ones that are also set in the default content type. I noticed you can do logic in the edit and disp forms related to content type, but is there a way to set fields/tabs per content type on the new form? Great solution. I am having an issue where i deployed the required files to a shared document library with the latest spjs-utility.js file (v1.15)and added the CEW to my list but every time i click on the new item i keep receiving a message that i need to download the latest version of spjs-utility. Any help would be much appreciated. Could it be that you have referred spjs-utility.js multiple times in the same page – and another, older version is loaded alongside? Thanks Alex. I found the issue appreciate the quick response. I’m a little behind on your updates and new to the SP/ JS realm. I am getting the same issue Jarret was having but have all the latest loaded. Any suggestions? Jarret, would you mind sharing your fix? Your solutions are fantastic. I am having one issue and have tried everything to fix it. 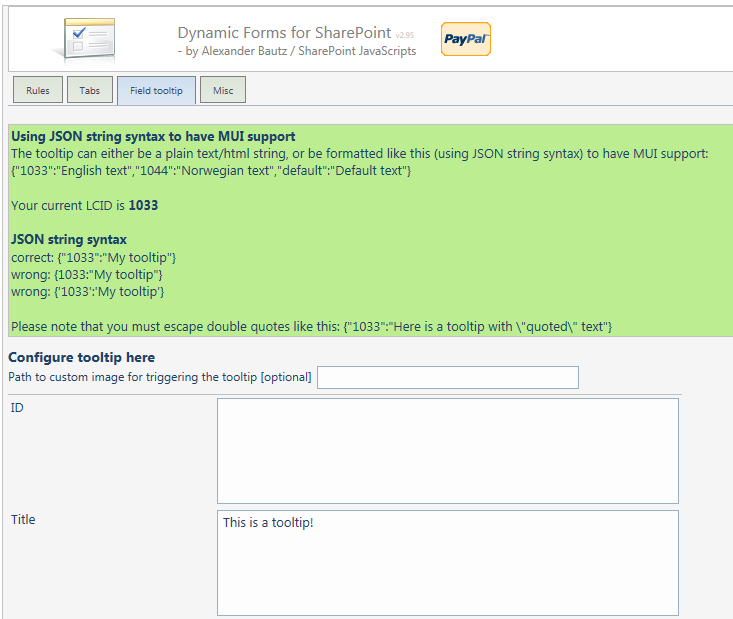 When I use Dynamic Forms on the EditForm on a Published page, I get the SharePoint Publishing Toolbar. It does not happen on a NewForm or a DispForm. 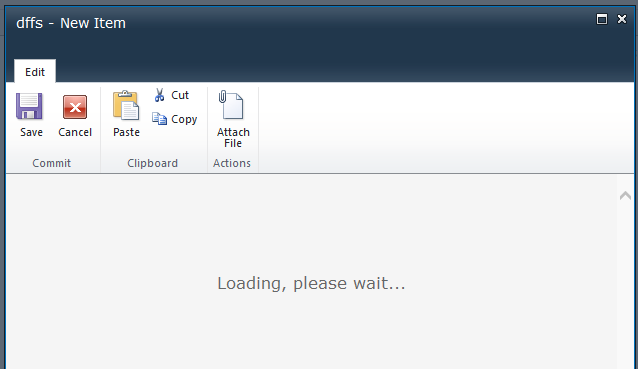 I am using SharePoint 2007. I have tried checking in and checking out the page. Do you have a suggestion for preventing the toolbar from appearing? I have not tested this solution with publishing feature enabled (my 2007 environment is WSS 3.0 and not MOSS). Is your page published and visible to other users? PS: Thank you for the beer! It is not necesarily that they aren’t showing but they display about 500 px up on the page so you can’t see the tooltip most of the time. Also when you go back to the tooltip after the first time it does not show at all. Any ideas? Fantastic solution that seems to be getting better by the day – many thanks. Now, of course, the question. Is there any way to make the rules conditional on which tab you are using? I have a form where data is entered into a field in tab 1 and then the completed field is shown in all the other tabs (to remind people without them having to flick backwards and forwards). Ideally in the other tabs they would not be able to edit the field (because if they can they will, and if it’s an option they will think they should! ), although this is for cosmetic reasons as they can still go to tab 1. Sorry for the late reply. What you request is not possible at the moment. I think I am missing an ‘\’ somewhere on this lne because the remainder of the script is outputted on the screen. Check all the double quotes as they sometimes get the wrong format when copying and pasting. Try to download the file again by right clicking > save target as. Still no luck and cannot really see the conflict. I changed line 2075 “</script" to "<\/script" and now I do not see the code anymore however when I go into the setup now, it keeps asking me to create a new list and when I say OK, I get a pop up error with [spjs_Addlist] undefined. This just keeps getting better and better – epic work you do! Now I have found a small issue in regards to using index number of eg. heading, rules and tabs. It might not be a big problem if you only use a few headins and few rules, however for larger lists (With many columns) it’s a pain to clean up after a while. Any chance you will be able to fix this? The only way I can think of is to go from index numbers to unique names. This would mean that you will have to name the headings using an unique string when they are created, and that this name is used to identify the heading in the rules. No problem, I have added it to the next release. Alexander, I am having an issue when I upgrade from older versions of the script to one in the 2.9x series. I was using 2.51 on some Lists and when I upgraded there are now several columns that repeat at the bottom of every tab. Have you encountered this before? When I test a new release I check backwards compatibility with the previous version only. There has been many updates since 2.51, but i think you should be OK if you enter setup and save it. When I saved the setup, it fixed the EditForm and NewForm, but not the DispForm. When I compare the “blob” between the three forms, the DispForm looks totally different. The “blob” is different as DispForm has less functionality. Which fields is showing – is it any “logic” to it? Do you have any other solutions loaded in the same page? I converted another existing list from 2.51 to 2.981 and all the calculated columns that output HTML appear at the bottom of each tab. Try loading the text-to-html solution before dffs and see if this helps. Ok, I tested that and there was no change. Then I tried removing Christophe’s script from the DispForm and the issue went away. Hi, I removed the script as a test, but I can’t leave it that way per user requirements. Is there a way to make them compatible? Or can HTML rendering code by added to your DFFS solution? I added a few lines to support rendering calculated columns containing HTML as HTML in DispForm. Could you check it out (v2.982)? Thanks! But unfortunately that didn’t change anything for me. I also tried loading it after the Text2HTML script and it didn’t work either. Its supposed to replace it – did you try it without Text2HTML? Ah, yes, replacing it worked perfectly! Thank you! Alexander, I’m sorry but I think this update broke the ToolTip feature. I used html tags in my tooltips and now they don’t show up on hover. I did a quick test here and both plain text and HTML tooltip works for ordinary fields as well as calculated fields rendered as HTML. Could there be something else wrong? The SPJS-FormFieldTooltip congifuration list has all the values in the JSON column. But the DFFS Tool Tip GUI is all blank where the HTML used to be. The columns in my form that previously had tool tips still show the tool tip icon on the correct fields, but when I hover over them I get a little empty box. I tried to open the configuration form and save it to see if it would reset but that didn’t work. I’ll keep looking for clues. 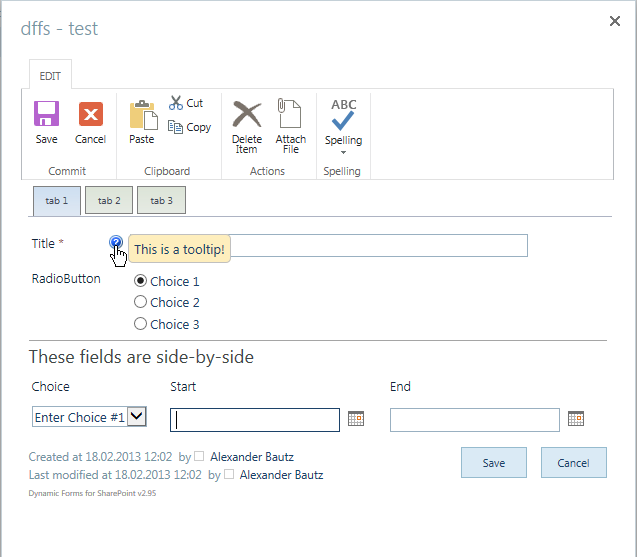 The tooltip solution is now built in and the tooltip configuration is set up in the DFFS solution. The standalone tooltip solution should not be called anymore. You will have to reenter or move the configuration manually to the DFFS solution. Yep, you got it! I removed the script reference to the stand alone tooltip and everything works perfect. Thanks again! I created a role that sets [today] value into a Date column, but it’s not working. How can I do when a rule were true, this Date column recieve this function([today]? This should be straight forward. How is your rule set up, and what kind of columns is your trigger? I would like to see whether I can assign as required a managed metadata column using a trigger (e.g. if this document is assigned to a person, then u need to require a protocol number, which is managed metadata). Alexander, would you consider adding your “Redirect from NewForm to EditForm or custom page” solution to DFFS? Also, can there be an option to open the EditForm to the tab that is visible when the user click the Edit button? The default is to open the EditForm to the first tab. Hey Alexander. I’ve set up a rule for my form which states that if a drop-down choice is set to a certain value, a person or group field is visible and required. However, even if I fill in a person in the now required field, it states that I must fill in a person in that field. Also, I’m having trouble with Multi line text fields (Plain text) not wrapping the text (making the dialog very wide). Using the latest version of JQuery (1.10.x) throws an alert saying it’s out of date. Alexander- This thing is awesome. Thank you! Anton- I’m having the same issue you described above. Did you find a solution? I am having the same problem as Jim A reported above on SP2007. The tooltip is showing too high in the page, I can barely see the last sentence of the text from the tooltip. And also, when I go back to the tooltip the second time, it isn’t showing anything at all. I updated all the files, what else could be the problem? I am still seeing this issue. Anybody find a solution? I have a question about the logged in user in group with ID and logged in user not in group with ID rule options. I am unable to get DF to recognize any of the groups I enter. I am copying the SharePoint group name directly from the Group list in SharePoint. Is there some other ID for the Groups I should be using? You are supposed to use the id number and not the name. Is there any possibility to make these 2 solutions Cascading dropdowns & Dynamic Forms work together? I might have found a bug. Using the latest version. When using the option these field are optional (and visible). It works fine with a trigger field on the NewForm, but on the EditForm the fields only show when the trigger field is changed to a different value and than back to the trigger value. I have the same problem as you Eric. 10 SQL server configurations with 200+ attributes – when a user selects a config and 50-120 attributes then appear depending on server config selected everything works brilliantly with NEW, DISPLAY but in EDIT – only the mandatory ones show up. Move the optional items into Mandatory and they all show up. Move back to optional and they disappear from edit. TEMPORARY SOLUTION: As stated by Eric, select a different server type (in my case), then attributes are refreshed, select the required server type you originally selected again and all (mandatory, “optional” and hide fields) will appear as they should. Not good for a production system but we can live with that for the time being. GREAT TOOL. Looking forward to a fix one day. I cannot reproduce this behavior, could you send me screenshots of the rules related to this triggerfield? Let me try to explain in more detail. On a form I have a ‘Yes/No’ listbox. Initially I configured a rule to trigger ‘These fields are optional (and visible)’ when this listbox has the value ‘Yes’. The optional fields are ‘Initially hidden fields’. Let’s say we create a new item, when setting the listbox value to ‘Yes’ the optional fields nicely become visible. Now when editing this item, while the listbox value is ‘Yes’ it does not show the optional fields, they remain hidden unless the listbox value is changed manually. When we change the trigger to ‘These fields are required (and visible)’ all works fine. The fields become visible when editing the item. Hope this helps to troubleshoot it further. Which version of the solution are you using? Unknown fieldType: SPFieldBusinessData, please ensure you use the function init_fields_v2(). Any chance support for that column type can be added, or a case to ignore it so it can still be used without rules (currently sets it to read only in the edit form with the error text)? In troubleshooting, I looked at one of my trigger rules, which was checking to see if a particular field was not equal to Null. I simply changed that to something else, it the error went away. It was an easy fix for me, but just thought I’d pass along to you. Thanks for this terrific solution–nice work! I’m hoping you can help me understand the “Rules” section. I have the latest version of the solution and all the latest files. Tabs are working and everything. I just don’t understand how to get the rules to work! I have 1 form with 3 tabs. TAB 1: Basic fields like Name, Date. One field is “required”. TAB 2: Has 1 drop down choose yes or no and 1 lookup column. TAB 3: Has 2 drop down choice boxes, and 2 y/n radio buttons. 2.) User selects “YES” from “required” drop down in TAB1. Are you able to help me figure this out? I’m having a hard time understanding the logic of the rules and there’s no examples for me to follow I can find. I was able to finally get TAB 3 to hide onload. And then show when “required field” is YES. So that’s wonderful! 1.) If user changes his selection of “YES” to “NO”, then TAB 3 does not hide again. 2. )Completely different issue: After I set configurations, I click “save”. But, because some fields are “required”, the Configurator will not let me out of the page and the SP Ribbon will not change from “Save” to “Stop Edit” like it should. I have to completely abandon the page and go back to my list> Settings>Edit Form Web Part. I will release a new version shortly that will fix these issues. Alexander, this solution currently has the Checkboxes in Multiple columns option. Can you add radio buttons? I have your older script called “Wrap choice-field in multiple columns: Updated version” but it would be convenient if they were packaged together. This will be added in the next version. Hi, love this solution! I ran into one small issue although it doesn’t prevent anyone from using it. Anyways, I have a checkbox field with 12 items in it, as well as the ability for the user to enter his/her own. In the config I have this field setup to display in 3 columns. All works well. Unfortunately, the “fill-in” blank, appears under the 1st column (whereas the ‘Specify your own value’ appears at the bottmo of the 3rd column). Anyway to get them to align properly, one under the other? We have encountered another timing issue (similar to the one for vLookup) in the 2013 environment. Sometimes we get the alert for error in Custom JS and we have no Custom JS in any of our config files. Pressing OK or cancel and the error goes away and is difficult to reproduce. Here are the lines of code that seem to be executing sometimes but difficult to reproduce. I have not had the time to further test this in SP2013 and the quick fix would be to comment out the alert to let it “fail silently”. I’ll keep this in mind when I get the opportunity to do further SP2013 testing. In SharePoint 2013, Enhanced Rich Text fields work but not when you have the Append Changes option selected. When you have the Append Change option selected for an enhanced rich text field when you select the field you do not get the enhanced rich text ribbon and when you enter data and save no data is saved and the field box flashes after pressing save. Append Changes works fine for simple multiline text fields. Seems like I recall a similar issue a long time ago in the SharePoint 2010 environment that you fixed. I tested this and found that if you are using “Rich text (Bold, italics, text alignment, hyperlinks)” and “Append Changes to Existing Text” you experience the behavior you describe. If you however select “Enhanced rich text (Rich text with pictures, tables, and hyperlinks)” and “Append Changes to Existing Text” it works as expected. Is this correct in your setup as well? Yes we have the same results — and I think Rich Text is only an option if you have migrated from 2010 site… if you define a new multiline field in SharePoint 2013 the only option is Enhanced Rich Text so this issue is not really worthwhile addressing. Is there a way to easily copy the settings from one list to another? I have multiple lists that uses the same form, but because of authorisation issues, I had to seperate those lists. It would be nice if I don’t have to apply the same changes multiple times to different lists. Thanks for your hard work! Go to the list where the configuration is stored and copy / paste the “blob”. When having a heading configured as the 1st row on a form the input cursor is active in the default field but you are not able to type unless you move the cursor to another field and back. Is this a bug? is there a way to hide the tab heading? I have two tabs for the EditForm and only one is available depending on which group the current user is in. Problem is at the top it still shows the heading of the one tab available to the user — I’ve tried hiding it with some CSS but so far nothing has worked! Correction; I mean that the *name* of the tab appears at the top and that’s what I want to remove; the tab name, not any field/group headings. sorry to ask so many questions but now I’ve got an issue that I can’t resolve — for some reason all of a sudden i’m getting an error on the NewForm.aspx — when I try to go into the Dynamic Form Set up (where it says “click here to edit” at the bottom of the form the page it takes me to is mostly blank and I get the little exlamantion point at the bottom of the IE window…Expanding that says “Object doesn’t support this property or method” and shows line 223 char 3 of the spjs-utility.js. I can’t remove this error — I’ve deleted all the .js files and reloaded them back to the library to no effect. I even created a *new* library and a *new* list and re-downloaded the .js files from your site and I’m still getting this message!! This only applies to the NewForm…Disp and Edit work perfectly. I am trying to use the rule to pre-fill a few fields. Can I do this with a user ID instead of a group ID? Not sure what you are trying to do. Are you trying to trigger a rule for one specific person? You can compare dates in DFFS as you describe. Alexander – thanks for the prompt reply. But, I must be missing something. I see where the form says “if this trigger is” – then I put in the qualifier as less than, but “This value” is expecting a specific static value, is that correct? I don’t see where I can compare two fields. Thanks Much – that works! I’m still stuck with the problem to make these solutions (Cascading dropdowns and Dynamic Forms) work together.. When I add Cascading dropdown webpart under Dynamic Forms, my dropdowns appear in each Tab. Is there anything I can do to fix this? Can I use the cascading dropdown as function in a tab? Does anyone know how to? First, I’m new to SharePoint and I wanted to say how great this form application is. It is much easier than building customize form on each page. 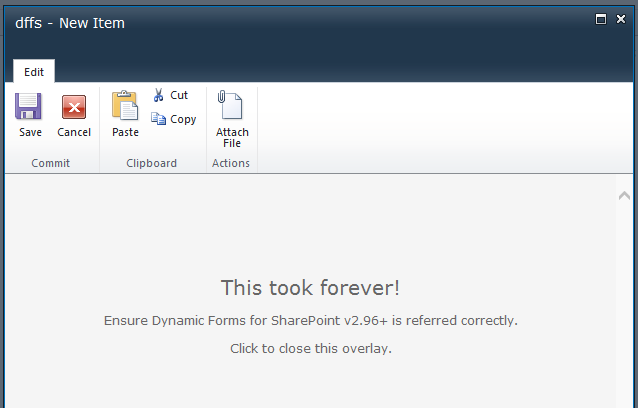 I’ve downloaded 3.15 and I love the Dynamic Form for SharePoint. I do have question on the form behavior. 1- I’ve notice it add an “Edit Item” at the bottom of the view form and that is really handy for editor, although, a user with no rights still see the “Edit Item” … It also change the default behavior of the view ribbon and make the “Edit Item” enable which wasn’t before we add the form scripts. Is there some setting I can change to prevent this behavior? 2- I have a title page which also contains the search bar (in the browse ribbon). As soon as the form is added to the page, the search bar disappears? How can we keep our search bar. 3- I wanted to add items before the tabs, I’ve notice, this script only allow item to be after the tabs? Is it easy to implement, can you guide me? On the same train of toughs, is it possible to have other item displayed above the content editor, I wanted to display the title & breadcrumbs, but, anything I add before the content editor adds it under the tabs. 1: Will look into this. 2: Screenshot please – not sure what you mean here. 3: The tabs are prepended to the top of the page. The code must be changed to allow this. If we forget what the password is, is there a way to clear it out? Can I just go into the config file for that view and remove something? Yes, the password can be removed if you hand edit the configuration. I was successful in getting the “Dynamic Forms for SharePoint v2.97 – Click to Edit” to appear at the bottom of a new form I’m working with. However, when I click to set-up the triggers, the only thing I can do is set-up a password to restrict edit access on the rules tab. None of the other fields appear for customization. What am I missing? Any errors in the developer console (hit F12 and select “Console”)? HTML1202: http://sharepoint3.bankofamerica.com/sites/GCBResearchAccess/Lists/GCB%20%20Global%20Research%20Access%20Request%20Form/NewForm.aspx?dfsetup=1 is running in Compatibility View because ‘Display intranet sites in Compatibility View’ is checked. From the error, it looks like you may have an error in the script references. Are you sure you have loaded all the required scripts? Which version of jQuery are you using? [DFFS :spjs.dffs.loadAndApplyRules] : Configuration error. Click OK to load last good configuration. When I click OK, it shows me my previous configuration. Any changes I do on the form is never saved. If you are, please send me the text from the setup list (SPJS-DynamicFormsForSharePoint) for the affected form – both the “blob” and the “lastGoodConfig”. Yes, I’m using the latest. I downloaded the latest version and it shows the same behavior. Which browser and SharePoint version are you using? Please download and test v3.22. I am fairly sure this will fix your problem. Let me know how it goes. I am brand new to you DFFS. It looks like exactly what I need. Unfortunately I am not able to Save my settings so I am never able to actually see how it functions. I had started with your TabsForSharePointForms which worked great. But the dynamic functionality of the DFFS looks like it will be even better. When I click the Save button I get an “Object doesn’t support property or method ‘prop'” message on line 3236 of DynamicFormsForSharePoint_v2.js. I know this is an older version, but any help you can provide would be greatly appreciated. First off I would recommend that you updated to the latest version (v3.346). Secondly you must ensure you haven’t loaded an older version of jQuery somewhere else in the page that overrides the version you load with dffs (v1.72). “prop” is not supported prior to jQuery v1.6. Thanks. I did have a reference to an older version of jQuery in the form. Updated that and everything is OK. Very impressed with the easy of defining the tabs and rules. This will definately be part of my development for the ticketing system I am building. Again, thanks for the quick response. I will definately be “buying you a couple of beers” once I get everything working. this is great stuff. I’m glad it worked out, ensure you update to the latest version before you go ahead with the ticket system. I am trying to test your DFFS solution on a document list. When trying to configure the solution, I can see the tabs, but all the options inside the tabs are mostly gone… for example, the ‘Rules’ and ‘Tabs’ tabs are completely empty! I get this error: SCRIPT438: Object doesn’t support property or method ‘filterNode’ (spjs-utility.js, line 247 character 3). I am running SP 2010 and DFFS v3.346 and spjs-utility.js v1.183. I should have also mentioned I’m using jquery v1.10.2. I’m fairly sure your problem is related to loading jQuery more than once in the page. On my newitem list form jquery.min.js(v1.7.2) file is loading once from master page design and one from my content editor webpart. I cannot avoid Master page JQuery instance, because many functionality depending on that JQuery file. If i am removing the JQuery instance from CEWP, it’s missing Dynamic form functionality. Kindly help me how to fix the issue. Not sure how your page layout is, but from the symptoms, the jQuery prototype function added by SPJS utility is overwritten because another jQuery version is loaded. If you already have jQuery in the master page, you should be able to remove the jQuery call in DFFS and be good to go. If this is not working, there must be something with the order of loading the scripts. Finally configuered things are not showing, only Password to restrict edit access with pwdbox showing. Below this: 3 buttons are showing ; Delete, Save, Cancel. Even i am not able to add rule here. Can you please share, what should be the issue? if i am not reffering again the same jquery(which is used in Master page) inside DFFS CEWP, existing configuration not working + adding new configuration is not showing. FYI: this JQuery file is working on other environment, when i am configuring DFFS. Only difference, here no JQuery file reffered in master page. Which version of DFFS and spjs-utility.js are you using in the two sites? – is it the same? – I’m not sure if this has anything to do with it, but it might be worth looking into. PS: you find the version information in the top of the file. Have you looked at the latest version of DFFS? – if you are using v2.x it is a good idea to upgrade. For both site, i am using the same version. The filternode prototype function is present in spjs-utility.js, and the only reason for it to be missing is that the original jQuery namespace is overwritten by another jQuery file being loaded. We have been using your product for a couple of months and think it is great! The tooltips and the process to hide/show fields depending on various field contents. Yesterday I modified the first index (0) with 1 field based on a Content Type with minimal fields. All the other indexes reverted to only have those few fields available in the first index and all the tooltips for those extra fields were removed. This morning, I reviewed the All Content screen in Sharepoint and saved it, reviewed the Dynamic Form and all the fields were available again, but I need to reset up the tooltips and add them back to each index. Any ideas? I don’t want this to happen in Production. In the meantime I am going to put the All Content as index (0) and the content with the least amount of fields at the bottom. I’m not sure I understand exactly what you describe, but if you use content types, DFFS cannot show fields not in the selected content type. In DFFS backend however, you will be able to select these fields, but they will not show in the “frontend” form as long as they are not part of the content type. If you have more details, please post a new topic in the forum.